This living pile of ooze has low attack power, but remarkable defence. Physical blows merely sink into its squishy body, and if it’s blown apart, the pieces will reform; however, it is vulnerable to being boiled or frozen. It can bind and entangle its opponents by throwing viscous blobs of goo at them. Feral Slimoks will aggregate in sewers, storm drains and other dank, moist places, where they feed on mold, fungus and bacterial mats. This helps keep these places clean, but if there are too many of them their slime can clog up pipes. Aww, it wants a hug. 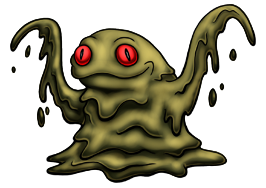 A nice standard blob/slime monster, and the frog-like face gives it a unique flair.